‘Disaster Management’ sounds like a coaching badge previous England football bosses should have taken, but not Gareth Southgate, who has transformed the England team. His latest new waistcoat, however, was a hi-viz Serve On equipment vest as we put him and other top UK coaches through a challenging disaster experience. Kitted out in safety helmets, goggles and overalls, the elite trainers charged with bringing gold medals and silverware to UK sports were taught how to cope with catastrophe the Serve On way. It’s a scenario that England Rugby have also been putting their Under-20, future internationals through, and also the England Women’s Rugby Squad. Serve On was chosen by UK Sport’s World Class Coaching Elite Programme to put their top trainers through pressure situations they would not be used to. Southgate, along with GB Paralympics head coach Paula Dunn, England Rugby Sevens head coach Simon Amor, British Athletics head of endurance Barry Fudge, GB Rowing’s U-23s and juniors chief coach Peter Sheppard, British Canoeing slalom head coach Mark Ratcliffe and England Rugby forwards coach Steve Borthwick arrived at Serve On’s training HQ in Wiltshire to be pitched straight into disaster scenarios designed to take them far out of their comfort zone. In the darkness and under the watchful eye of the USAR technicians, the coaches had to dig through rubble to recover casualties from a ‘collapsed building’ and rescue victims of a ‘road traffic accident’ and had to take charge as the operations were complicated by distraught relatives demanding they get their loved ones out. The coaches also had to deal with a ‘riot’ situation which ended with them being ‘taken into custody’ and ‘interrogated’ by local security forces. Intelligence experts from the Applied Influence Group put them under intense scrutiny in one-on-one quizzes. The real pressure ramped up, however, as the trainers ran the Operations Room, managing the constantly-developing disaster scenario based on Serve On volunteers’ own experiences, dealing with rescues, water shortages, communications problems, refugees, incoming supplies and the imminent arrival of a hurricane. Chris Stott from UK Sport said: “The elite programme coaches are here to learn from the expertise that Serve On has and to see what they can take from how they (Serve On) operate back into their daily training environment and competitions. “The are also here to really test their own skills in various areas that they have been working on in the elite programme. After being put through his paces by the Serve On volunteers, he said: “It’s been a really good insight into the (humanitarian) work that goes on. I don’t think any of us appreciated exactly how much goes into any operation, and the skills required, the bravery that is required for some of the rescue situations and some of the relationships you have to build with local communities. 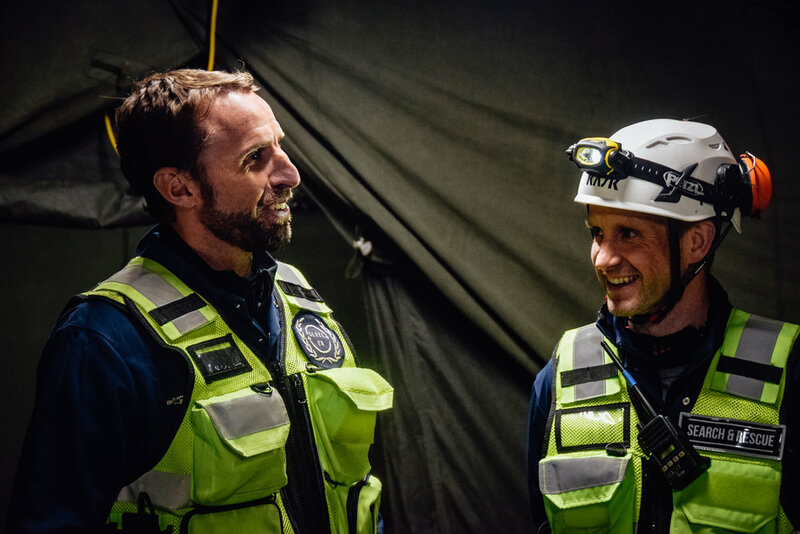 England football head coach Gareth Southgate and other elite UK trainers rescue casualties from a ‘collapsed building’ during a disaster experience exercise with Serve On humanitarian response charity. Paula Dunn said: “It has been brilliant,” and Simon Amos said: “I’m blown away by what you (Serve On) do. England Rugby have twice put U-20s players they believe are destined to be future stars through Serve On’s disaster scenario exercises, and players who have gone on to international experience include Ted Hill, Marcus Smith, Ben Earl, Nick Isiekwe and Joe Cokanasiga. Trainers on the UK Sport elite coaching programme carry out a rescue in a road traffic accident scenario during a disaster experience with Serve On humanitarian response charity. England’s all-conquering Women’s Rugby Squad also went through Serve On’s disaster exercises before the last World Cup and showed just why their on-field decision-making is so good.